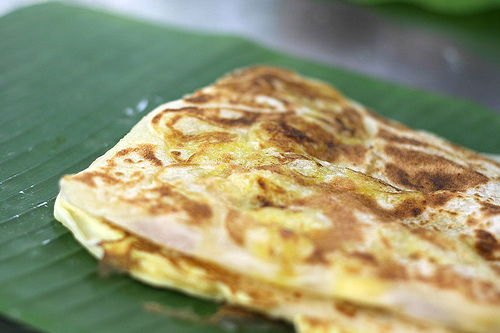 Roti canai is a type of flatbread found in Malaysia. Roti canai is circular and flat. There are two ways to make roti canai that is either to twirl it until the dough becomes a very thin sheet and then fold it into a circular shape or to spread out the dough as thinly as possible before being folded. Then the folded dough is grilled with oil. The first method is more popular and faster than the second. 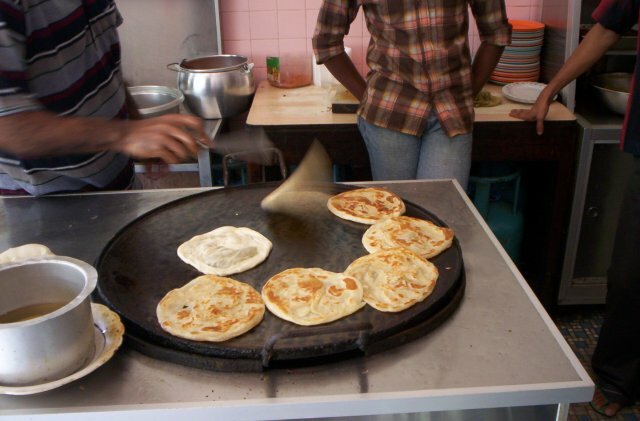 In English and in Chinese, roti canai is sometimes referred to as "flying bread", a term that evokes the process of tossing and spinning by which it is made. The dish is composed of dough containing copious amounts of fat, egg, flour and water (although eggless vegetarian versions do exist). The form of fat used is usually ghee (clarified butter). Some people add sweetened condensed milk to the mix. The entire mixture is kneaded thoroughly, flattened, oiled and folded repeatedly. It is then allowed to proof and rise, and the process is repeated. The final round of preparation consists of flattening the dough ball, coating it with oil and then cooking on a flat iron skillet with a lot of oil. The ideal roti is flat, fluffy on the inside but crispy and flaky on the outside. Left: Roti canai is cooked on a flat iron skillet with a lot of oil. Most plain roti are round while those with fillings are square in shape due to the folding of the roti.